When the quiet monks on the Holy Island of Lindisfarne saw the dragon ships approaching, they didn’t know what was coming. They were fully unprepared for the ferocity of the warriors, armed with sword, axe and shield. The attack and plunder of Lindisfarne, a rich and unprotected monastery, echoed throughout the next 300 years of European history. The Viking Age had begun. Historians use the term the Viking Age to describe the turbulent expansion of the Scandinavian people into Europe and Russia. 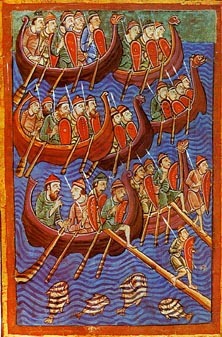 Beginning in A.D. 793 with the Lindisfarne raid, Norwegians, Swedes and Danes set to raiding. Any unprotected community was a target. Vikings attacked places all along the coasts of Scotland, England, Ireland, France, Italy and inland Russia. They terrorized, plundered, traded, explored and finally settled and farmed all over the lands they encountered. Simply put, the Vikings were Norwegians, Swedes and Danes, men who were usually farmers, traders, blacksmiths, and craftsmen. For various reasons, they took to raiding towns, churches and monasteries. Many of the places they attacked were on the coasts as they were easiest to reach. With their swift and easily landed ships, the Vikings could quickly swarm over the communities, killing and looting, and just as fast return to their ships and leave. They were gone before any defense or counter-attack could be made. Strangely enough, for most of the men who went a-viking, it was only part time. When a Viking wasn’t busy farming, planting crops, for instance, they left their farms and went raiding. They often returned in time for harvest in the fall. Raiding was very profitable, however, and many farmers became full time pirates and raiders. The people called Vikings were also fearless explorers who actually reached North America, making them the first Europeans to discover America. They settled Iceland and tried to colonize Greenland. They were also shrewd and competent traders and merchants. They traded all the goods of the north – furs, amber, iron and timber – for all the goods of the south – silver, gold, silks and spices. And all along the trade routes, the Vikings traded in slaves. Read our articles to explore these aspects of the incredible culture of these intrepid and dangerous men. Scholars debate why the Scandinavian people began to go raiding in the late 8th century. Most likely it was a combination of factors that lead to the Vikings setting off in their long boats to raid other communities. We’ll discuss these reasons in articles you’ll find here, explaining why they left their farms and blacksmith forges to first attack and finally settle all over Europe and Russia. The Vikings’ advanced ships and navigation techniques provided the means and skills for sailing not only over open ocean out of the sight of land but also far up inland rivers into the interior of other countries. 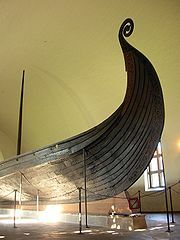 Viking ship technology made the fearful Viking raids possible. Special ship construction techniques made the long ships and larger dragon ships versatile enough to sail great distances, carry up to 200 men, withstand rough seas while still being light enough to drag over land or carry through portages. Explore with us as we consider Viking ship building and navigation skills. 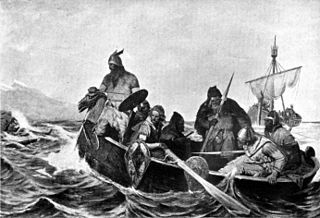 Contemporaries of the Vikings were awed by their ships and sailing skills. Find out why by reading further. The Scandinavians changed the history of Ireland, England, Russia and other European countries. They established new territories in Iceland, Greenland and temporarily, North America. From A.D. 793 to 1066, Vikings raided, traded, challenged, conquered and settled in many lands. Popular movies and novels give you a glimpse into their lives, but usually show only a part of the impact these energetic people had on the known world of the time. Reading here will give you a much better grasp of their impact on other cultures. We will explore Viking culture and the structure of their society, the roles of men and women and the daily life of the time. Here you will find articles on women and children in that warrior culture. You’ll discover how they lived, what their homes were like and what they did for fun. Examine their stunning artwork and jewelry, as well as their weaponry and armor. The brave among you can read about a Viking raid from the point of view of the victims. Come with us as we take ship with Vikings to explore the new lands of Iceland and Vinland. We’ll explain Viking ship building and their remarkable navigation skills. 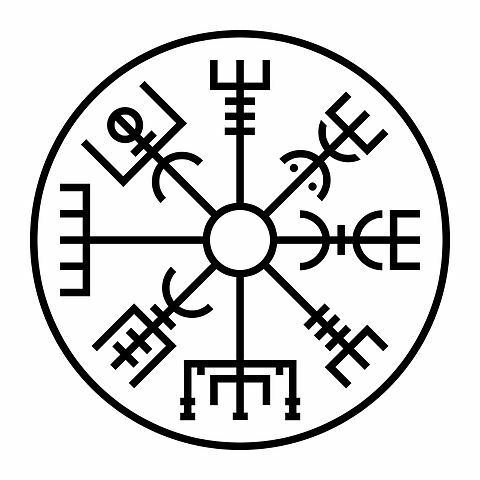 Find out what your name would look like in runes, the Viking writing system. Explore with us the mythology and literature of the Viking era.